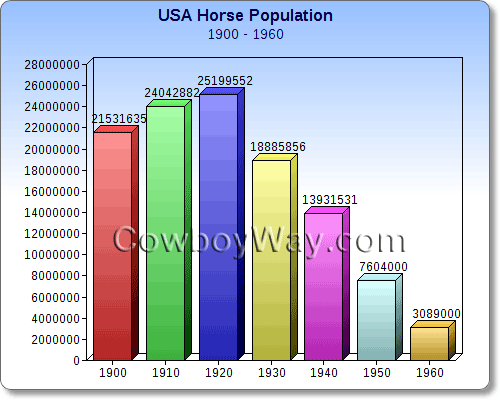 Below is a graph representing the number of horses and mules in the United States of America from 1900-1960. The drastic drop in numbers is attributed to the mechanization of America where the widespread use of machinery replaced horses and mules for power. As you can see in the graph, for the period of 1900-1960 the population hit its high in 1920 with a combined population of horses and mules of over 25 million. The low was in 1960 with a population of just over 3 million - a drop of over 22 million horses and mules in just 40 years. The current estimated number of horses in the United States is just approximately 9.2 million. This figure represents the horse population only, and does not include mules and/or ponies. It also does not include horses living on federal lands or maintained in government holding facilities.